Spring Break and so much more!! If you turn on MTV during the spring, you will likely see scenes of Panama City Beach Florida. That is because MTV has named it “The Official Spring Break Headquarters”. For good reason too. According to the 2005 census, the city has a year round population of about 11,500 people, but during the Spring Break months of March & April, the population can grow to over 100,000. The city itself is 7.0 square miles and there are approximately 27 miles of white sand beaches. Throw in some great party spots, like Club La Vela, and Panama City Beach becomes “Party Central”. After a day on the beach, put on your party clothes and check out the nightlife. 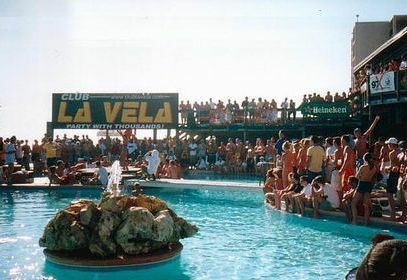 Club La Vela. is the largest nightclub in America and one of the trendiest in the world. It currently has 14 theme rooms and they add more all the time. They have live entertainment and concerts weekly, Ladies Night every Friday and they even have 'theme' night, such as 80's Mania, on Sunday Night. If you don’t feel like leaving the beach, Sharky's is your spot. Sharky's claims to be the world’s largest tiki bar, so this makes for a great party place both day and night. Another popular club is the Coyote Ugly Saloon, the one made famous by the movie. They have nightly drink specials, concerts and special events. 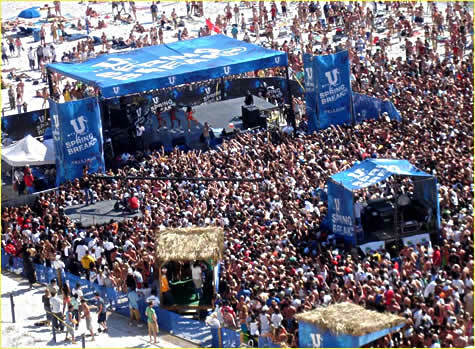 As you can see from the pictures above & below, during spring break, there is plenty of daytime parties as well. So you can begin to get the picture that this town can be a happening place, and at Spring Break, it can be absolutely out of control. However, all that being said, Panama City Beach is also a great place for everyone in the family. You can enjoy all kinds of water sports and boating here. The fishing is great. If you scuba dive, there are many sunken ships off the coast here to explore. If you'd rather be golfing, you're in the right place - Golf Digest ranked Panama City Beach the third best golf city in America. For the kids and young at heart, There are plenty of family amusement centers with fun activities like miniature golf, go-carts and games of all types. One of the better of these places is Shipwreck Island Water Park. It's 20 acres of slides and flumes, wave pools and beaches. There is something for every member of the family (except maybe the dog). In fact, I have had some of my 3rd graders in Sunday school endorse this thoroughly. One of the best features about this beach though, is that you can still find that Southern hospitality and quaint beach charm. Combine this with claims to being the "Seafood Capital of the World", where many, many places feature a fresh catch everyday, and this becomes one of the best overall beaches anywhere. With well over 21,000 hotel, motel and condominium units available, the accommodations here offer a diverse selection that can meet every need. Whatever your looking for, you’re sure to find all the options you need to ensure vacation satisfaction! Whether it is a cozy motel or brand new condo, whatever you like, you'll find it here. There are a myriad of options, from beachfront to inland, from deluxe suites to studios, from kid-friendly to couples-only. 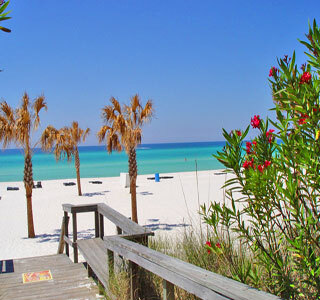 You’ll find a perfect fit for you in the Panama City Beach accommodations choices! With so many places to stay and play, you'll never want to leave. Do you have a great story about a Spring Break exploit, something amazing, fun, or just plain crazy you or your friends did while visiting Panama City Beach? Are there any hotels, night clubs, or activities that you really loved? Share them here, and let the world know. If it is stuff legends are made of I might just add it to this page.